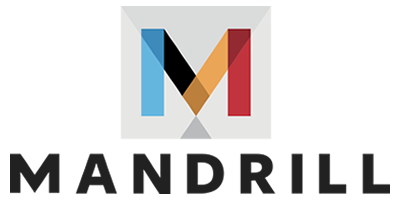 Rules are a flexible way sophisticated, non-programmers can change sending behavior based on searchable criteria in Mandrill emails. The rules engine lets you take specific actions when events or messages meet criteria you've set. You can also view example rules to help you get started. For example, "if any email is sent from notifications@example.com then add the 'notifications' tag." Each rule can have one or more conditions. Each rule can take one or more actions. Rules can both change the content of messages and match on the content of messages, so it's important that they are applied in a consistent order. For example, you might have one rule that matches emails from a specific sender that sets the template to my-template. You may also have another rule that matches emails using my-template and adds the tag my-tag. Whether or not the email has my-tag depends on whether the rule to add the template is applied before or after the rule that adds the tag. To help control this, Mandrill lets you sort your rules, and they will be applied consistently from the top of the list to the bottom. This can give you a lot of power by creating rules that prepare for other rules further down the list. API keys without descriptions aren't available for rule conditions. 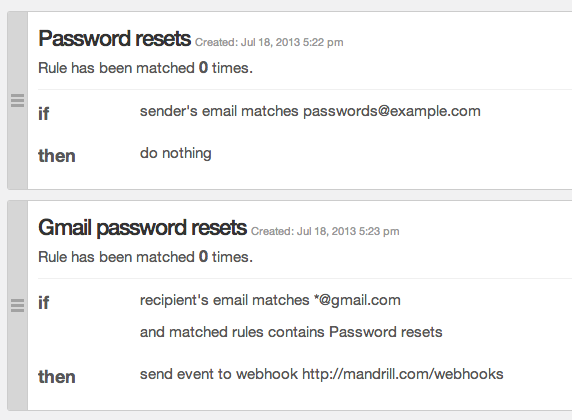 Manage API keys on the SMTP & API Info page in your Mandrill account.